I don’t recall seeing this practice much back in the States, but in Japan they love to plaster walls with the same exact advertisement poster. It wouldn’t be uncommon to walk around town spotting walls of the same ad covering a whole wall. They also do this with TV commercials where they show the same commercial right after the first one finishes. Sometimes the commercials are slightly different, but often times not. It almost feels like a glitch in the Matrix. Like a glitch in the Matrix. You get the point. This is an ad for Spoon brand sugar. To me this advertisement almost looks like a retro 1960’s style fashion ad, but then again maybe I’ve just been watching too much Mad Men lately. These ads were posted in Yokohama station for the Toyoko line. The copy next to the woman’s head reads “Sugar has always been Spoon brand.”（お砂糖は、ずっと、スプーン印）. The copy below the central spoon logo reads “Thanks to you, Spoon is celebrating its 50th anniversary” (おかげさまで、スプーン印は５０周年）. 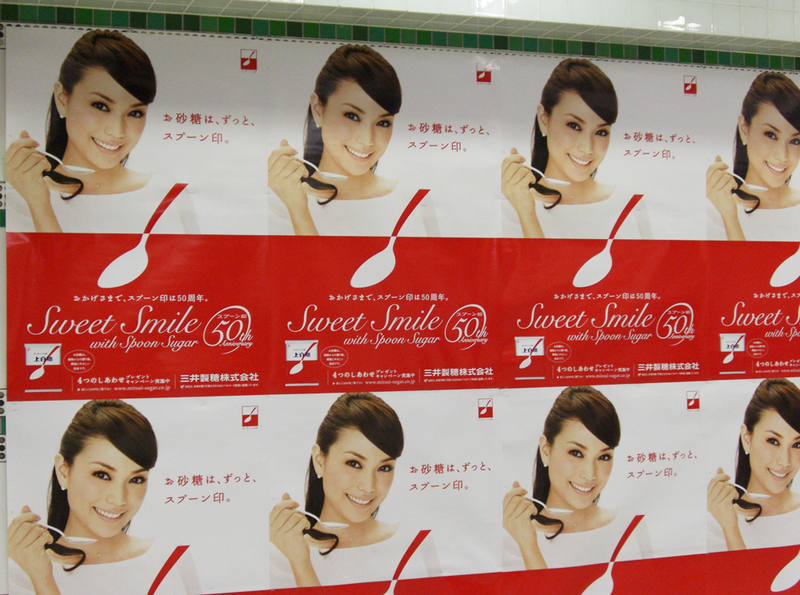 Below that in English it reads “Sweet Smile with Spoon Sugar.” with a 50th Anniversary logo. (FYI- Did I mention the use of English or “Engrish,” in advertisements and packaging is a popular trend in Japan.) Bottom left shows what I think is the packaging and next to it is a some type of give-away campaign they have going on with a link to the corporate website for Mitsui Sugar which I am guessing is the parent company of the Spoon brand. You are currently browsing the Ads of Japan. Advertisiments and popular Japanese advertising campaigns blog archives for March, 2009.